The fabulous Haka Classic Rally takes place in New Zealand from October 31 to November 25 this year, and it’s going to be the experience of a lifetime. Exploring both the North and South Islands, from Auckland to Christchurch, we’ll experience some of the world’s most astonishing landscapes, from spectacular mountains and active volcanoes to forests, lakes, glaciers and dramatic coastlines. We’ll be staying in the most luxurious hotels, enjoying the finest wines and cuisine New Zealand has to offer and visiting many of the country’s world-class cultural attractions, from Lord of the Rings movie sets and locations to director Sir Peter Jackson’s amazing vintage aircraft collection, delightful classic car museums, haunted mining settlements, the wonderfully eccentric Republic of Whangamomona and much else besides. With no fewer than seven rest days we’ll have time for shopping, spa treatments, stargazing, boat cruises, whale-watching, adventure sports and more. The rally itself will a sporting challenge par excellence. Renowned British Clerk of the Course Peter Rushforth and his Kiwi deputy Rhys Nolan have devised a route that takes in some of the greatest driving roads on Earth, from the legendary Forgotten World Highway to the fantastic Crown Range. With an average daily distance of just 143 miles (230km) it will not be arduous, but it will certainly be exciting – Peter and Rhys have planned a fantastic variety of tests, from thrilling 60mph regularities on empty gravel roads through the mountains to superb open highways and several historic racing circuits. Every aspect of this exclusive and intimate event has been designed for your personal enjoyment, and as ever we’ll be accompanied by our own fully qualified mechanical and medical support teams. You don’t need a visa, and insurance and carnets will be arranged for you by Tysers and CARS UK. All you really need to do is deliver your car to CARS UK in Suffolk by August 30 – it will be waiting for you in Auckland, all ready for the adventure drive of a lifetime in the company of friends old and new. 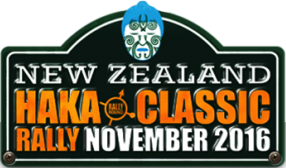 We’re keeping a few wonderful surprises up our sleeves of course, but to give you some idea of the delights we have in store we’ve published a recce report on our Haka Classic website page [click here], where you’ll also find an online entry form. To whet your appetite even further, BBC Two is currently running a three-part series – New Zealand: Earth’s Mythical Islands – which you can catch on TV or on the BBC iPlayer [click here]. The Guardian newspaper has published a gallery of stunning photographs from the series, which you may view at http://tinyurl.com/hxq6jwf [click here] – further proof, if any were needed, that a camera will be essential rally equipment! We very much hope you can join us on this superb event, and look forward to hearing from you, by telephone on +44 (0)1252 794 100 or by email to info@rallyround.co.uk. Remember we only have a couple of places available, so it’s first come, first served!